Attention Ladies! Are you ready for Assertiveness Boot Camp? Then pull on your fatigues, lace up your boots, and let’s get to work! 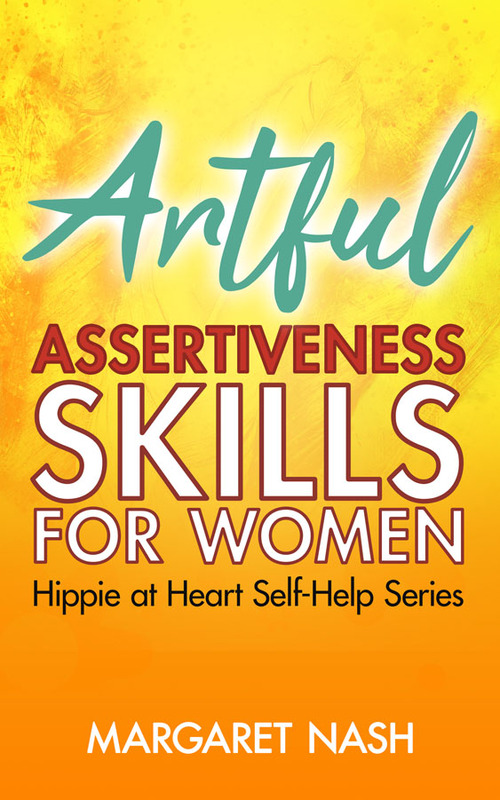 Welcome to Artful Assertiveness Skills for Women. And quit with the apologies and explanations for everything! This book will give you sentences to use, body language tips, and teach you how to exude an energy that makes people sit up, listen, and treat you with respect. Assertiveness works. Artful assertiveness works so well no one will notice. You can be assertive and still be nice. You can be assertive without appearing pushy. You can be assertive and everybody feels OK.
Learning just a few assertiveness techniques, simple phrases and body language will transform your life. That’s a promise! This is the 4th book in the Old Hippie at Heart Self-help Series by Margaret Nash, Life-Coach, Business Trainer, NLP Master Practitioner, self-help writer, aging brat, hippie at heart…as she shares her years of experience with clients, family, friends, dogs and cats, honing her assertiveness skills. (OK, it didn’t work with the cats. Available on Amazon.com! Paperback or Kindle.